Not all ultraviolet disinfection is alike. In fact, not all ultraviolet light is alike. Ultraviolet light is divided into UV-A, UV-B, and UV-C rays. It is the wavelengths in the UV-C spectrum which offer the greatest germicidal potential. Some UV disinfection systems, like xenon pulse UV, use the full spectrum of ultraviolet light to disperse germ-killing energy. 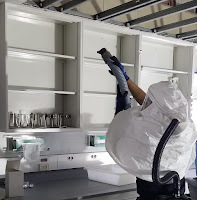 It is claimed that the xenon pulse is a more effective way to kill harmful bacteria because of its similarities to punching a wall, more punches will weaken it better than one. However, light is not a fist. It is a form of energy, and continual energy is more effective than turning it on and turning it off. Additionally, bulbs generating UV-A, UV-B, and UV-C wavelengths are inherently less effective in disinfection than continuous UV-C. The US Veterans Administration commissioned an infection prevention research team led by Curtis Donskey, M.D., to conduct an independent study of continuous ultraviolet disinfection versus xenon pulse UV disinfection. The study tested a continuous UV-C robot which was run for the same length of time from the same point in the room as a pulsed xenon (PU-UV) unit. 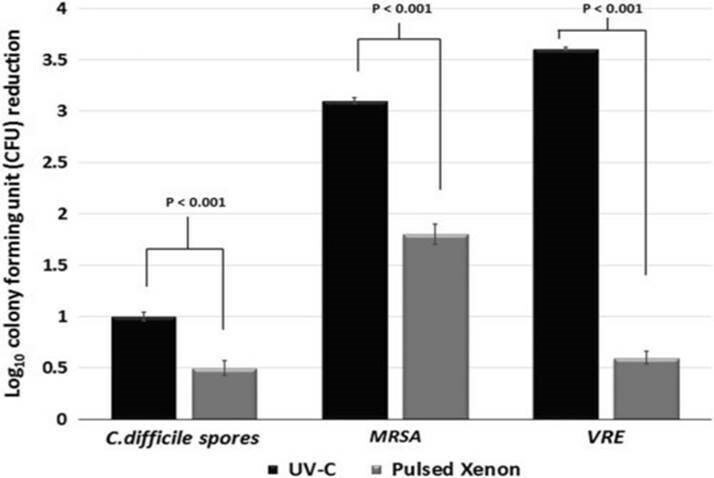 The results showed surprisingly low pathogen kill rates for the pulsed xenon device, about .5 log for both C.diff and VRE, even as close as 4 feet. The continuous UV-C robot demonstrated a much higher CFU reduction for the pathogens C. difficile, MRSA and VRE. The study states, “PX-UV was less effective than continuous UV-C in reducing pathogen recovery on glass slides with a 10-minute exposure time in similar hospital rooms” and “the UV-C device achieved significantly greater log10 CFU reductions than the PX-UV device”. Not only did the continuous UV-C robot in the study show much stronger disinfectant results, but that it was not run for its entire cycle time. The study calls attention to the dangers of bold claims and trying to complete a disinfectant procedure too quickly. when run for the same time (10 min.) at the same distance from glass microscope slides (4 ft). To read more on the comparison of these two technologies, click here.